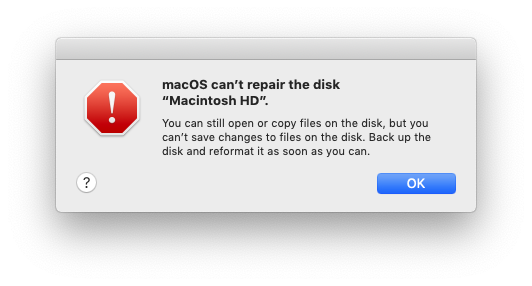 On macOS, if a disk is failing, you will sometimes get the message below. The OS will put the disk into read-only mode. You can get your files off of it but you can't write to it. My question is, is there any way to bypass this, and put the disk BACK into normal read-write mode? Have you tried repairing the disk from recovery HD or while booting into MacOS from a different hard drive? If you truly want to be able to write to that disk again I would recommend this attempt: Clone the HD to a different HD. Check the health of the new HD and make sure all the files are accountable. Then reformat the previous HD, check the health then put the files back... However, the disk may be writable again, it’s not going to be reliable. If I were you, I would get ready to retire drive. Not the answer you're looking for? Browse other questions tagged macos hard-drive disk-utility . Read a Linux Disk in MacOS?